How do I Remove Dome Nut Assembly on Shower Faucet Knob? 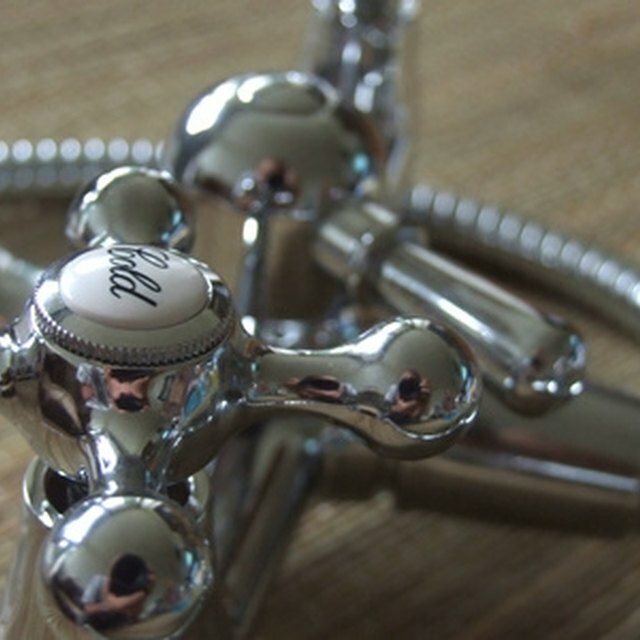 The accumulation of years of soap scum, mineral scale and other deposits on plumbing fixtures can make maintenance of those fixtures difficult. The ball retaining cap nut and adjusting ring (often referred to as the dome nut assembly due to its domed shape) found on older Delta type and similar single-temperature/volume control shower faucets is very susceptible to the buildup of deposits and corrosion due to its constant exposure to the shower environment. Remove the cap nut to gain access to the valve assembly in order to repair any valve-related leaks. Shut off the hot and cold water supplies to the shower. If separate shutoffs are not available, shut off main water valve. Open shower valve to allow water to drain out of the system. Remove the shower control knob. Loosen the set screw on the shower control handle (usually hidden on the underside of the knob) and remove the handle by pulling straight out. If no set screw is present, pry off the button in the center of the knob using a thin blade screwdriver, remove the retaining screw found underneath the button, and then pull the the knob straight off. Remove the trim sleeve. Pull the sleeve out with some gentle wiggling. If the trim sleeve is threaded or secured by twist lock, then rotate the sleeve as appropriate to remove. If corrosion or deposits make it difficult to rotate the sleeve, use the strap wrench. The cap nut assembly is now exposed. Unscrew the cap nut by hand. If the cap nut is seized, use the strap wrench, taking care not to twist or bend the valve housing. With the cap nut removed, the ball assembly is now exposed and you can proceed to overhaul the valve. Scrape away as much corrosion and deposits as you can using a screwdriver, the tip of a knife or similar tool. Pour a small amount of vinegar onto the cap nut and adjusting sleeve. Allow to stand for 30 to 60 minutes and repeat. After four to six applications, attempt to remove the cap nut. Do not force it. You can also soak a small rag or paper towel in vinegar, wrap this around the cap nut (be sure the base of the cap is liberally exposed to vinegar), cover tightly with plastic wrap and then leave overnight. Alternatively, use CLR or inhibited muriatic acid. Use an eye dropper to apply these stronger acids to the threads of cap nut and adjusting sleeve. Let stand for maximum of 15 minutes and flush with water before attempting to remove the cap nut. Heat the cap nut using a hair dryer and attempt to remove. If cap nut remains seized, allow to cool and heat using butane mini-torch or propane torch (a mini-torch will give you better control in the tight space). Be very careful not to touch the hot surfaces. Do not overheat or damage to plastic and rubber valve components can result. Attempt to remove cap nut while still hot using strap wrench or channel lock pliers with a rag or leather strip to protect the nut finish. If cap nut remains seized, allow to cool and repeat. Squeeze the base of the cap nut firmly using channel lock pliers. Repeat in top-to-bottom direction and again in side-to-side direction. Heat using torch as above and attempt to unscrew cap nut. Cut carefully through the base of the cap nut using the hacksaw blade holder. Keep your cut parallel to the axis of the control assembly. Be careful not to damage the threads on the valve housing. When you have cut to the top of the valve housing threads (the threads that mate with the cap nut threads) insert a large screwdriver blade into the cut and pry the nut apart. Beware of sharp surfaces. Take care to not twist or bend the valve housing. Remove and discard the cut nut. Replacement cap nuts are available in metal or plastic. Cost of a replacement nut ranges from $10 to $12 (as of 2010) for an OEM (original equipment manufacturer) nut assembly down to about five dollars for an aftermarket plastic replacement. If your control knob is large enough to hide the cap nut then a plastic replacement nut will prevent seizing in the future. If you decide to use a metal nut, or to reuse the existing metal nut, minimize seizing by applying plumbers' grease to the threads before reinstalling the nut. Always wear eye protection and rubber gloves when using strong chemicals such as CLR or muriatic acid. When heating components with a torch be careful not to direct the flame at combustible parts of the faucet assembly or the surrounding wall. The valve housing for these types of showers is normally supported by two relatively weak tubes that connect through the back of the housing to the hot and cold water. Applying too much force to the cap nut will cause these tubes to bend, kink, or break, possibly requiring complete replacement of the shower assembly.